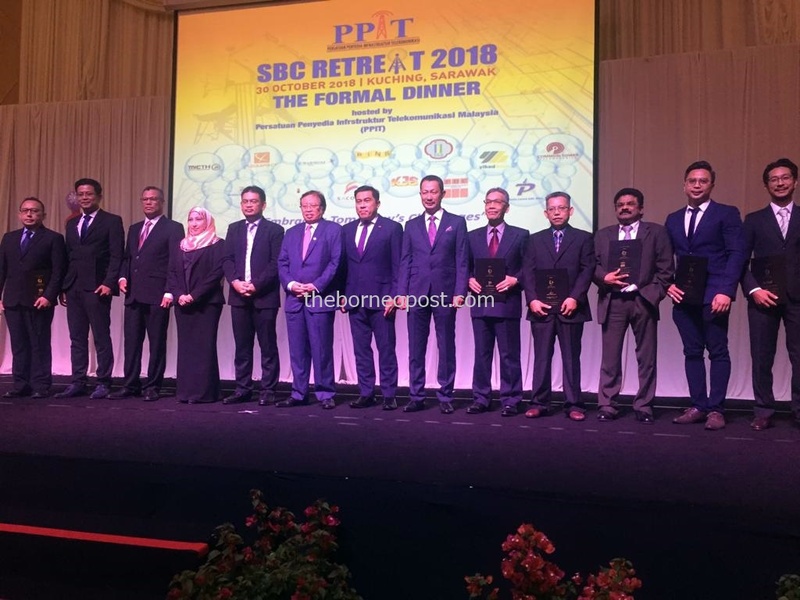 Abang Johari (sixth left) in a photo call with the representatives of the telecommunication providers at the dinner last night. KUCHING: Another 600 telecommunication towers are expected to be built throughout Sarawak next year. Chief Minister Datuk Patinggi Abang Johari Tun Openg said that the Sarawak government is committed to upgrade and expand telecommunication infrastructure and high speed internet, including in the rural areas with an allocation of RM1 billion. “Communication infrastructure is crucial. If we don’t have it, we cannot communicate. “By next year we will build about 600 telecommunication towers throughout Sarawak and that is why we need telecommunication providers to help the state government with this development,” he said. He said this at the Telecommunications Infrastructure Providers Association Malaysia (PPIT) and Sarawak Backed Companies (SBC ) Retreat Grand Dinner 2018 at the local hotel, which was attended by PPIT presiden Datuk Mohd Rehat Ahmad, Sacofa management and staff and telecommunication providers at a local hotel here last night. However, Abang Johari said having internet facilities are insufficient if Sarawak wants to transform its economy towards digital economy. He said telecommunication infrastructure providers must look into the perspective of internet speed at an affordable price. He said based on experience in education before this which was called Bestari School that only saw the school having internet speed of only four megabits per second (Mbps). “You can’t do anything with that kind of speed and before this, I have suggested to the Malaysian Communications and Multimedia Commission (MCMC) to upgrade the speed between 10 and 15 Mbps. “We can’t just have internet but no speed because infrastructure and speed must go hand-in-hand,” he said.